In 2006, two things happened. Well a lot of things happened, but for the purposes of this post, two things happened, one very important and the other which seemed less consequential. The important thing was that we started the China adoption process that would eventually lead us to Violet, and the lesser important thing was that I started working at Build-A-Bear Workshop in Downtown Disney. You can see why one is more important than the other. At that time, Build-A-Bear had a line of soft, stuffable dolls called Friends 2B Made. What many people don’t know is that there were actually two dolls in that line–one was a set of small, skinny dolls that we sold in our store (along with their various clothing items and accoutrements), and the other was a full-sized doll called a “Sweetheart Doll” that was only sold in the small handful of Friends 2B Made stores around the country. 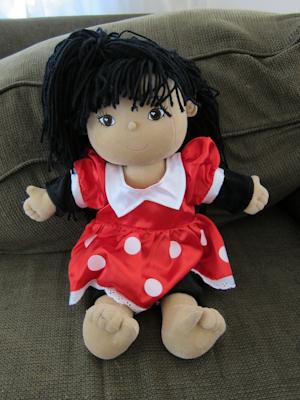 Going by faith, I bought a Sweetheart Doll with Asian features for our future daughter. Did you know that you can buy any Build-A-Bear animal unstuffed, then take it to any BABW location and they will stuff it for you for free? That’s what I did with this doll. Part of the Build-A-Bear experience is the heart ceremony, where you take a small stuffed heart, make a wish, and place it inside your new friend before it is sewn up. I wanted our future daughter to do her own heart ceremony. But then, like many, many other families, our China adoption stalled out. Our wait grew and grew. We kept ourselves busy. We had Theo, the baby we never thought we’d have. I stopped working at Build-A-Bear right before he was born. This doll that I’d purchased, limp and lifeless, got moved around from closet to shelf to stuffed-in-the-back-somewhere. But still, we kept the faith. Until finally, after 6 years, 3 months, 24 days, our dreams came true and we met Violet. The following year was a complete whirlwind. I all but abandoned my blog, juggling two kids–a cheeky but lovable 4 year old and a laughing, running hurricane of a toddler. It wasn’t until a year later that I was able to reflect on things. To slow down, take a deep breath, and take stock of all that had happened. To finally get into the groove of a new normal, a bigger family, a bigger heart. On November 11th we celebrated our one-year anniversary, our Violet Day. You can read about our celebration at Goofy’s Kitchen, Part 1 and Part 2. When we were making plans for Goofy’s Kitchen, it occurred to be that we’d be in Downtown Disney. And that’s when I knew. What had begun in 2006 had come full-circle. I dug the doll out of the closet and dusted her off. Her yarn hair was disheveled, and as I ran my fingers through the tangles I thought about everything we had been through, holding onto this doll that Build-A-Bear stopped making 4 years ago, holding onto our hope and dream. I put the doll in a bag and we headed out to Goofy’s Kitchen. After our meal we walked down to Build-A-Bear. The Bear Builder who helped us was amazed. He’d never seen a Sweeheart Doll but knew what it was and he was surprised to see an unstuffed one come into the store. Both Theo and Violet stepped on the pedal of the stuffing machine and blew some life into that floppy body. Then it was time for the heart ceremony. Theo took a heart for himself and chose one for Violet. They worked together like the team they are, best friends. Theo held the heart up to his chest to make a wish; Violet copied her big brother. Then they placed them inside the doll. I almost forgot to take a picture. Picking an outfit out for Violet’s new doll was a no-brainer–the Minnie Mouse dress. Finally we left the store, Theo happily swinging the empty box and Violet clutching her dolly, refusing to let her go. She loves it, plays with it, and insists on sleeping with it. In fact, I had to wait for her to be at preschool before I could even get a picture of it. But here she is. Thanks Kate :). It really is too bad they don’t make the dolls anymore. They fit the Build-A-Bear clothes!! And I much prefer soft dolls. Wonderful story! Brought tears to my eyes, too. You are truly blessed with a wonderful family. Thank you Leanne! :). It’s true, sometimes I am really amazed by how lucky and blessed we are. And now I’m a blubbering mess… What an amazing story! Thank you for sharing it with us! Thank you Roxann. And thanks for reading :). We were right there with you on the same timeline in 2006 and just brought our daughter home 2 years ago. The other day I put a dress on her that I bought in 2006, and then marveled that a little girl was actually finally wearing it. Thanks for sharing, I especially love the part about Theo and Violet working together. Yes, it was the same here, finally putting on clothes I’d bought so many years ago. What a grueling wait, but so worth it :). Hmmm, maybe you shouldn’t chop onions and read my blog at the same time ;). wonderful story! Our journey (aka wait) began in late 2005 and I also went to the build a bear store in the mills –mid 2006–and bought one of those dolls! Except I had it stuffed, put my own wish heart in, clothed it and named it for my future daughter. The wait was only supposed to be 8 mos so we set up her room and that doll sat there on a shelf for almost 3 yrs!! waiting for the little girl to love it. It finally happened of course and she’s not been with us for almost 5 yrs. The wait is so difficult, I feel so bad for anyone still stuck in it. Love the pix of Violet and Theo! Such a lovely story, Shelby! Thanks for sharing. Beautiful story, Shelby. I am so happy for you and your family.